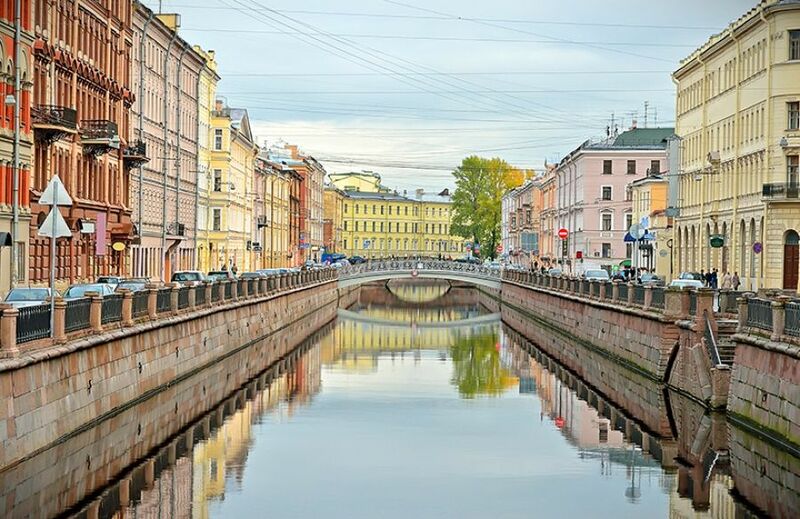 The Griboedov Canal can rightfully be referred to the most famous sights in St. Petersburg. It is located in the centre of the Northern Capital and crosses many central highways, including Nevsky Avenue next to the Kazan Cathedral. The embankments of the Griboedov Canal are a favorite place for tourists to walk, because here there are ancient buildings and temples and beautifully bridged skylines. On the area of the current Square of Arts, a river called Krivushi began from the swamp with two sleeves, which was also called Black for its dark water. The river was meandering and flowed through a remote marshy area, for which it was also called Glukhaya. In 1739, during the reign of Catherine II to protect the city from floods, it was decided to connect the Moika with the Fontanka, for which the river Krivusha was deepened and connected with the Moika. So the first part of the Catherine's ditch appeared, named after Catherine II, who was ruling at the time. The building of the channel, starting from the Moika at the Champ de Mars and flowing into the Fontanka from the Malo-Kalinov Bridge, continued from 1764 to 1790. The banks were dressed in granite and cast-iron grates were installed. After the revolution, the name of Catherine decided to change. The channel was named after Griboyedov. According to one version, this is the name of the revolutionary who died for the bright future of mankind. There is also an opinion that the building of the canals was supervised by an engineer named Griboedov and the channel was once called Griboedov Ditch. But to call it by the name of the engineer was not solid and therefore decided to call the channel by the name of the writer Griboyedov, who lived here at the house number 104 from 1816 to 1818, and six years later the word "writer" was forgotten and the channel became known as Griboyedov. For reference: Alexander Sergeevich Griboedov wrote a famous play "Woe from Wit" and was a poet, composer and diplomat.He died in Tehran in 1829, when a crowd of religious Islamic fans broke into the diplomatic mission of Russia and defeated it. 37 diplomats were stoned and hacked. The body of A.S.Griboyedov was transported to Tiflis and buried in a mountain in a grotto near the church of St. David. Later, for the settlement of relations with Russia, the Persian shah brought to Nicholas I many gifts, among which was the diamond "Shah". On the embankment are such famous monuments of architecture as the Kazan Cathedral and the Church of the Savior on Blood - the Resurrection of Christ. You will see St. Nicholas Cathedral and Theater Square, the former fire department at Kalinkin Bridge and the narrowest house in the city where I. Repin lived.In the house number 140 there used to be a Jewish national canteen and ritual pools of mikve. This area has always been associated with the work of poets and writers, artists and musicians. In the house of N.N.Vsevolzhsky (No.109) held a meeting of the "Green Lamp" Society, which included F.N.Glinka, A.A.Delvig and A.S.Pushkin. Here lived N.G.Chernyshevsky and N.V.Gogol, and in the 1930syears in the house number 9 in the two upper floors a writer's cooperative was created, where many famous writers and poets, artists lived. Now there is a museum-apartment of M. Zoshchenko, who also lived and died in this house. In Leningrad in the late 60's was a joke. What is the difference between the Griboedov channel and Suez? The thing is that on Suez the Jews sit on one side, and on Griboyedov - on both. Well-known political columnist Valentin Zorin was also born here. It is said that when US Secretary of State Henry Kissinger was in the Union, he asked Valentin Zorin: "Please tell me, Mr. Zorin, are you a Jew?- I am Russian.- Ah. And I'm American". On the waterfront in the family of writer Mikhail Kozakov and editor Zoya Nikitina was born future actor Mikhail Kazakov. The guests of their home were often Evgeny Shvarts, Anna Akhmatova and Anatoly Mariengof. Through the Griboyedov Canal, 21 bridges are tossed, among which there are interesting constructions and decorations. Lion and Bank bridges, designed by German engineer Wilhelm Tretter and built in 1826, can be called unique. These are pedestrian suspension bridges, one of which is decorated with sculptures of lions, the other - sculptures of griffins, designed by P.P.Sokolov. Initially, the bridges were wooden, later they were replaced by metal bridges. People often call them bridges on a thread.In addition to the Lion and Bank Bridge, the Pochtamsky Bridge across the Moika is also hanging. Not far from the Kazan Cathedral is the Bank Bridge, along the edges of which there are pairs of winged lions - griffins, holding in the jaws metal chains on which the bridge deck is suspended. Their powerful wings are covered with gilding and are raised upwards. According to legend, these mythical creatures are reliable guards of gold and therefore they were installed opposite the Assignation Bank. Now griffins "protect" students of the St. Petersburg State University of Economics and Finance. A very beautiful cast-iron lattice with patterns in the form of leaves of palms and fans during the restoration in the late 19th century was lost and restored only in 1952. Griffins are constantly attacked by vandals who scrape gold, break wings and steal lamp caps. The Lion Bridge is located in 10 minutes of walk from Isaakievskaya Square, where the canal bends around Bolshaya, Middle and Malaya Podyacheskie streets. You can also reach the bridge from Sadovaya metro station, Sennaya square and Spasskaya (1 km). The bridge is decorated with paired sculptures of lions holding chains in their jaws. Cast-iron grilles have patterns in the form of elongated rhombuses with floral rosettes, and in the middle of the spans are installed lights. A smaller copy of the lion bridge in 1838 was installed in Berlin. Kolomna bridge was built in 1906 and was originally wooden.In 1960, when its structures were dilapidated, it was decided to build a new ferry from aluminum, bearing structures of which were aluminum pipes with a diameter of 270 mm. The bridge, opened in 1969, is located on Volodya Ermak Street. Aluminum bridges are also built in the north of Quebec in Canada and through the Oxford Channel in Hardwick in the UK. At the confluence of the Griboedov Canal with the Moika in the middle of the 18th century, the Malo-Konjushenny Bridge was located perpendicular to each other - through the Moika and Pervoy-Konyushenny (now the Theater) bridge - through the Griboyedov Canal. Both bridges were wooden and in the early 19th century, when the ferries decided to rebuild, in the idea of ​​K. Rossi it was decided to connect them at one point. In addition, the third overland bridge, having a decorative character, was also built. The bridge began to be called the Three-Colored and Three-Grocery, located 10 minutes walk from the metro station "Nevsky Prospekt". The Griboedov Canal is a favorite place for residents of the Northern capital and guests for walks and visits, from here excursions on the boat along the rivers and canals of St. Petersburg begin.